Home / Artwork / Kitchen Renovation… It’s not done, but it’s looking good! 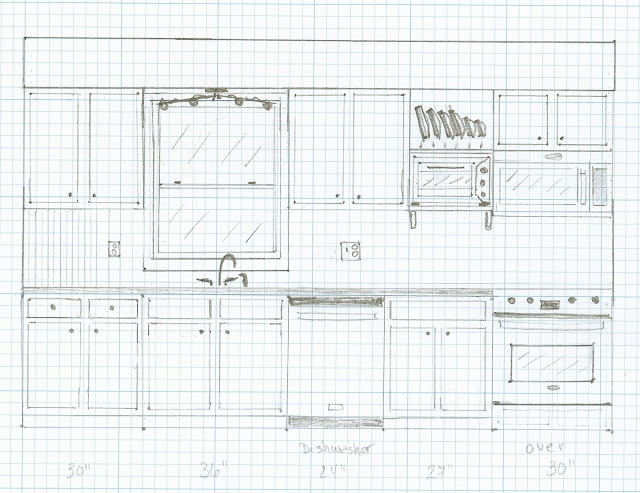 Kitchen Renovation… It’s not done, but it’s looking good! Turns out this renovation is going to take a bit longer than I had hoped. Jim discovered that the subfloor under the sink will probably have to be replaced, because at some point there was a bad leak that wasn’t addressed right away. Now there is some mushiness under there that we just can’t ignore when we move the cabinets around. Luckily, we do have the uppers done, so that’s a good thing. I’m thrilled with the cabinet Jim made for me to fill the empty spot between two of the upper cabinets. It is not exactly what I envisioned, but he put a lot of work into it and it looks wonderful. Kitchen before, with the old stove, and the blank, empty spots between cabinets. Here’s a during picture. Jim had installed the new cabinet that was the correct size for over the stove, and he had installed the microwave. I was already loving it, but we still had the empty spot between the two cabinets that was wasted space. Kitchen in between, with the new microwave and new replacement cabinet. It already looked a lot better. By the way, I love our new microwave. It works so much better than our countertop microwave worked, and it freed up a lot of space. Now, here’s what the upper cabinets look like now! Kitchen after, with new stove, new microwave, and two new cabinets–one made by my husband. I love having the lids to my pots handy, and it works really well to have a space dedicated for our toaster oven. Again, it freed up a lot of space. The hard part was figuring out how to properly vent the cabinet so the toaster oven wouldn’t be a fire hazard. You can’t see it, but there is a hole in the side of the cabinet on the vent side of the oven that allows for circulation. So what did I do with all the space I gained? Well, we now have a coffee center, and I’ve brought my KitchenAid Mixer out of hiding. Coffee center… Also storage for cutting boards and knives. Notice that our coffee pot is on a marble lazy susan? Well, that’s because Jim is left handed and the lazy susan allows him to turn the pot so it’s more convenient for him to pour the water into it. It works out really well. Having the coffee pot located out of the work area has saved us from bumping into each other in the mornings. It took a little getting used to the new placement, but it really has made the kitchen more efficient–a necessity for a kitchen as small as ours! And here’s where my KitchenAid has landed. It now has a place of honor where it will be easy for me to use. Before it was on a shelf in our laundry room, and I had to haul it into the kitchen whenever I wanted to use it. Anyone who has a KitchenAid knows how heavy they are, so you know it didn’t get used much when I had to drag it out. Now it will get used a lot. KitchenAid Mixer’s place of honor. There is still an awful lot to do, but I’m really happy with the progress so far. Of course, you know I can already see how it’s going to look in my mind’s eye, which makes me really eager to get on with the rest of it. But I know we probably won’t do anything more with it, as far as the construction part, until after the holidays. Although, I will be repainting the kitchen starting next week. 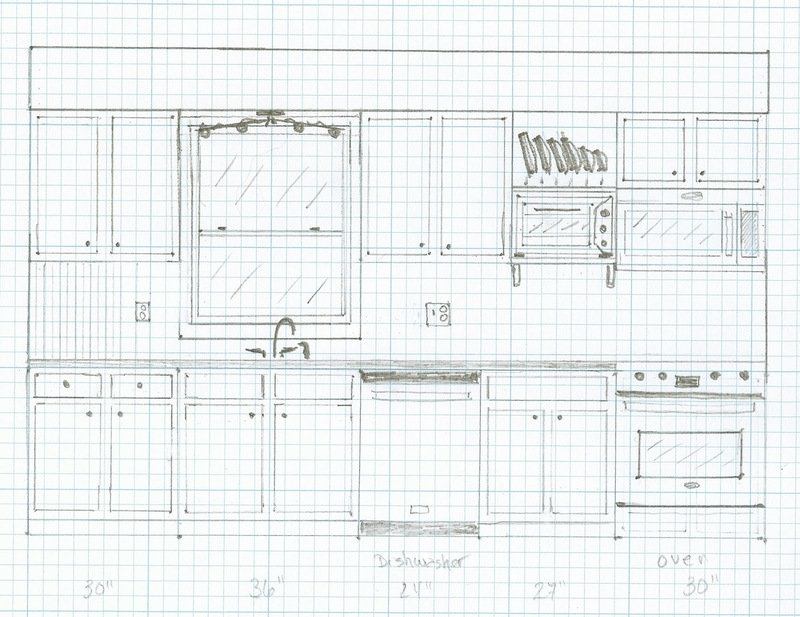 I thought I’d show you the drawing I did again… I think the finished product of the upper cabinets looks pretty close to my drawing. If you’re wondering about the artwork on the shelves. It’s some of my own pieces, and they’re for sale in my online shop, Moments of Art. They are called Romance I, Romance II and Romance III. I created them with either a green background or the white background as shown. I’m not objective by any means, but I think they give the perfect vintage shabby romance look to the shelves. My plan was to go with the green background, when I put the two different backgrounds up to see which I liked best, the white won out with the white cabinets. So…. That’s about all I have to share about the kitchen for now. There will be more changes, so stay tuned!! !